Like Merchant Ships: Happy Spring! The sun streams in our windows so early, I've been waking at 5:15 most mornings. Our guests arrive a week from today. So much to do! I did take a moment to walk outside and clip some of our last spring flowers: the aging lilacs which barely bloom and the daffodils which peaked too soon. I could have worked in the yard for hours and not noticing the passing of a single minute. 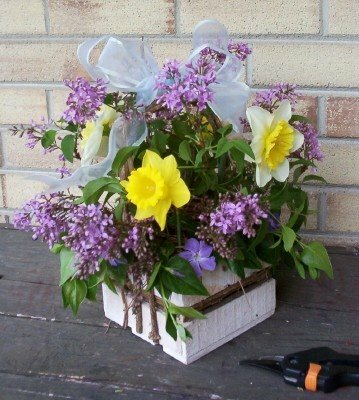 The individual cuttings looked scraggly at first, but combined in a thrift store container, make a sweet-smelling basket for a friend. Don't you just love springtime? How beautiful! Everything down here is still brown and dead(and we live in Florida!) It is so nice to see something so spring-y! You really are talented! What a beautiful gift! You are so talented, Meredith! I have been following your blog since the Dollar Stretcher article that you wrote. I just want to say that you are extremely creative. I love all your ideas and admire your thriftiness. Have you ever arranged flowers professionally? If not, you should look into that someday as a possible home-based business. AnnMarie, I guess I really meant "the early spring flowers." Here the star magnolia and forsythia are dying down, the daffodils bloomed too early due to a warm February, and our lilac and redbud tree were too old and diseased to put out many flowers.